Cats Protection is hoping to track down the owners of a gorgeous ginger cat found on a coach in Newcastle. Do you have any information about Wendall? As the vehicle was undergoing maintenance, it was not being used by members of the public, so there was no one to witness the cat’s remarkable voyage. 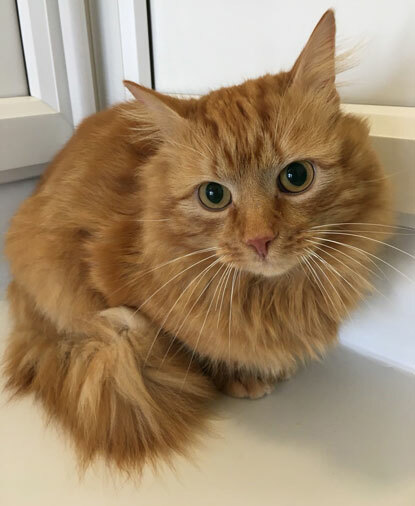 After being found on the coach at Newcastle, the ginger puss was taken to Cats Protection’s Gildersome Homing Centre, where he was named Wendall – German for traveller. The centre’s Deputy Manager, Catherine Hubbard, said: “We are appealing far and wide in the hope that Wendall’s original owners see this plea and come forward. If we haven’t heard from them by Thursday 29 March, we will be looking to rehome Wendall, so we really do urge anyone who recognises him to get in touch. As he was not microchipped, we have no way of tracing his owners. If you have any information about Wendall, please contact Gildersome Homing Centre on 03000 121 505. To find out more about the importance of microchipping, visit the Cats Protection website.